I recently did a quick 3 day trip down to Big Sur to attend a workshop on book publishing put on by the Center for Photographic Art in Carmel. It was taught by Chris Pichler of Nazraeli Press, and David Gardiner, master printer of some of the finest photography books available. The workshop was well worth attending for me since they covered some technical issues about paper, binding, and color management that pertained to self-publishing fine art books. I also had the opportunity to go to a few sunset spots along the Big Sur coast to do some photography. The fog retreated enough in the evenings to allow for some nice sunset lighting along the coast. 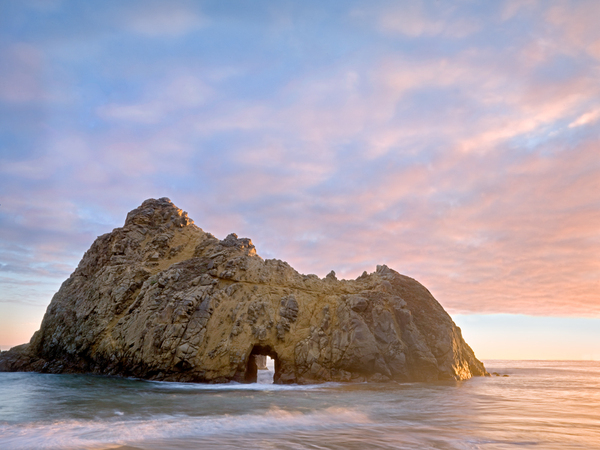 Big Sur is a dramatic landscape within a fairly compact geographic area south of Carmel, and offers wonderful opportunities for landscape photography. I have posted the shots from the trip on my website - the new ones are the first 4 shots in the Pacific Coast portfolio. They were taken at Point Lobos State Park and Pfeiffer Beach State Park. The images are all combinations of exposures - one exposure for highlights is merged with an exposure for the midtones and shadows to give a higher dynamic range than can be accomplished with one exposure. This allows creation of images and prints that are closer to what the human eye can perceive in color range and shadow/ highlight detail. I think that digital high dynamic range imagery is revolutionizing landscape photography by making it possible to create prints with a broader range of exposure and color detail. This shot below would have resulted in the arch shot being completely in dark shadow, but with a combination of a shot exposed for the sky combined with one exposed for the rock (combined with layers in Photoshop) the result is closer to what I saw that evening. The difficult part is combining the layers so there is no fringing between the darker areas and the highlights. Beautiful Images. How did you capture the soft light at Point Lobos? The park opens late and closes fairly early. I just got your book and I'm really enjoying it. Thanks! Thanks Craig - The park closes 1/2 hour after sunset, so we had enough time to wait for the last bit of twilight before heading out. It is a relatively small park so the hike out to the point is not more than 15 minutes. I was lucky to have some evening sunlight this time of the year - often it is too foggy to get good sunset images in the summer. Wow! what a great shot. I have been following your work since I first read about you in the Hasselblad forum magazine (V1, 2006). Just love your photos.